Providing you the best range of servo drives for material handling industry and brush less servo drives with effective & timely delivery. Leveraging on our years of experience we offer Servo Drives for Material Handling Industry. These servo drives, servo drives and ac drives are simple, fast and reliable systems that are offered at the most affordable prices. These Servo Drives sre easy to operate and the display offer several status parameters. We ensure about a safe deliberation of our product. 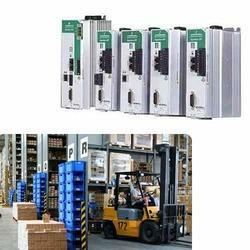 Looking for “Servo Drives for Material Handling Industry”?